If you are a farmer or gardener, you have likely encountered snails, and they can sometimes be a problem. Snail infestations often need to be controlled in one way or another, often meaning said snails will die, perhaps from some Sluggo or simply removing them by hand. But, if you have to deal with a snail problem anyway, why waste such a tasty food product? You may recognize escargot as a delicacy, but you may not know that it can be made with your common garden snail. The only real difference is that snails used to make typical escargot have stronger shells, making them easier to process. If, however, you’re interested in using your own snails as food, the method below is tried and true. Just note that you may also not want to use garden snails if you think there is a risk of them having encountered pesticides, for example those used in a neighbors yard. First gather your garden snails. It would be good if you identify your snails and make sure they are safe to eat before cooking. 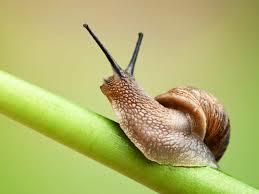 Any non-poisonous snail should theoretically be fine, but garden snails are preferable. Starve snails in a clean container or series of containers for two days. Provide constant water, but no food. This will allow the snails to clean out their systems. Depending on how many you stuff into one container, containers may need to be cleaned once or twice to ensure sanitary conditions. Do not use chemical cleaners. Soap is fine so long as the containers are properly rinsed and no residue is left over. Make sure most of the container is dry to keep sanitary, preferably with a water tray or two. Now you are ready to prepare your snails. Put snails in a container of room-temperature water so that they come out of their shells. Heat a pot of water until it is at full boil (this will ensure snails die instantly and as humanely as possible). You may need to boil several batches to ensure snails hit full boiling water, as adding snails will likely make the water cool down drastically. Boil for three minutes, then remove snails and place on a plate. Wait for snails to cool before shelling. It is best to have a container nearby to put empty shells. Using a fork gently poke snails and remove from shells. If boiled properly, snails should come out smoothly. Nest, you will need to clean your snails of remaining mucus. Put snails in relatively light vinegar-water solution for thirty minutes. After this, put in normal water for another thirty minutes to dissipate vinegar. Congratulations, your snails are finally ready to freeze/cook. You may want to take a nap. Food can be found in places we don’t expect. The arroyo that runs by my house in a suburb of Albuquerque offers up plump prickly pear tunas every fall, urging me to get out the tongs. It takes time and patience to harvest and process these magenta marvels, but the delicate flavor is well worth the effort. Wild-crafting can be really fun and wonderful but these fruits are generally smaller in size. Residential, no-spray cactus are terrific since they usually have received some irrigation, are larger, and generally more accessible. Many home-owners are willing to share. Ask permission first and then say thank you with a jar of their fruit’s jelly! A ripe tuna is full magenta, no green on the fruit at the stem end. Definitely use metal tongs for removing fruit. Clasp the fruit the long way and then gently twist. Pops right off. Sometimes you need to tug a bit even if ripe. Drop into large sturdy buckets. No bags. Wear gloves, long sleeved shirt, long pants, closed toe shoes, and for the really safety conscious – sunglasses. Watch where you are standing, leaning and reaching – there are many spines on cactuses. Glochids – these are tiny hair-like short spines clumped together in what look like little round patches all over the fruit. WOW – these hurt. More Tunas than we know how to deal with! There are many ways to process the fruit – burning off glochids, scrubbing with heavy duty brushes, rubbing with thick leather, putting whole fruit into Vitamix!! – all can work. It all depends on what you are doing and where. Our processing tips are for the home or school processing site for juicing. After harvesting, put prickly pears in a big shallow pan or tub and scrub with long handled scrub brushes. Dump onto rinse area and rinse with water. This helps to reduce glochids. Removes bird poop and mouse droppings too! Caitlyn using NEW, CLEAN toilet scrubbers! Cutting – we used large low-sided trays, held fruit with tongs or metal forks and cut and scooped this way. We liked it better than wearing one heavy duty leather glove. For best jelly – taste and appearance – use only the insides of the fruits. NOT the skins. Cut large fruit down the long axis, using an ice cream scoop, scoop out the pulp and seeds. Put in big pot. Add tiny splash of water to make sure there is liquid in bottom of pot. Bring to quiet boil, simmer and process for 10-15mins max. For juicing – use whole fruits just cut in half and/or the skins left from scooping out the insides. Add enough water to not quite cover the fruit. Strain thru fine mesh strainer. It’s worth $20-30 for a really good double layer, fine mesh strainer. You can also strain thru an old t-shirt and then its tie-dyed! Or use cheese cloth. We did double batches and it worked fine. We did an experiment with Pomona Pectin which relies on a different set of chemical reactions and used Agave. Make sure this powder is completely 100% dissolved before adding to juice or it will be very lumpy. Pour four cups of the prickly pear juice into a pot and add a half cup of lemon juice. If juice has been refrigerated, bring it up to warm temp BEFORE adding the next dry ingredients. Mix a quarter cup of the sugar and a box of low/no sugar pectin and add to the juice. Sprinkle in slowly while friend stirs. Bring the mixture to a full boil (a rolling boil). Add the remaining sugar slowly and bring back to a full boil. Boil for one minute, stirring constantly. May need to reduce temp a bit or move off and on the burner so it doesn’t boil over. For the next 2 steps, work rapidly so the mixture does not cool and thicken while you are ladling into jars. At end of 1 minute, take off the heat. Using a flat large spoon and skim off the foam. Glass jars should be tempered in really hot water. The sink works well and you can add boiling water periodically to keep them really hot. Put your ladle or metal measuring cup in this hot bath so it’s hot too when you start ladling jelly. Wipe to remove excess jelly. If applying lids and rings, finger tighten at this point. Then you can either let the jars cool and refrigerate OR following your favorite canning recipe. There are 12 varieties of fruiting Opuntia cactus. Opuntia engelmannii (Englemann’s Prickly Pear) is native to the Sonoran Desert, and likely can found very near your house. Opuntia ficus indica is a larger, cultivated prickly pear that is often thornless and therefore easily harvested. Englemann’s Prickly Pear has pinkish flower buds that open to yellow flowers. The immature fruit is green and matures to red, pink, or magenta. Pads are paddle-shaped and slightly larger than an adult’s outspread hand. Mature pads are green with medium to long spines. Thanks to Tom, Alia and Barbara MacFarlane for allowing us to harvest their fruit!